7PM 3/2/2012 Update – Despite the fresh new snow, we’re still ON! Come rally at 6AM to help break trail for this fun event. Our sponsors (Black Diamond, Gregory, Liberty Mountain, Knead-a-Massage) have donated prizes, which a few lucky (randomly chosen) pledge-makers will receive. Hope to see you bright and early. Pretty funny screenshot of SPOT tracker page here. Those who know me often laugh at how often I go up Grandeur Peak. I have been up it countless times via many different routes, in every possible form of weather, with every type of gear, and at just about every hour of the day. In winter months going up the west side of Grandeur can often mean starting in smoggy, cold, polluted air and climbing up to warmer clean air above. Locals call this an “inversion”, which is a bit of a misnomer. The Salt Lake Basin is a topographic basin where stable thermal layers (including inversions) often form. The air pollution problem is not caused by inversions, it is caused by pollutants that are emitted into the stable layers. It is a bitter-sweet feeling sitting on the 8,300′ summit looking down at a glowing cloud of pollution below, realizing that I must go back down into it. The topography of the area, mixed with pollution from the well over 2 million people and industry can render some very unhealthy conditions. The conditions are unique enough that many studies have been performed in Salt Lake Basin. In fact, one of the world’s foremost experts in environmental epidemiology and public health, C. Arden Pope, of Brigham Young University (BYU) helped establish the connection between air pollution and health problems. His research has influenced environmental policy in the United States and Europe, contributing to the establishment of emission standards for particulate matter pollution. PCAPS Field Measurement Image - Grandeur is the top-right series of green dots. 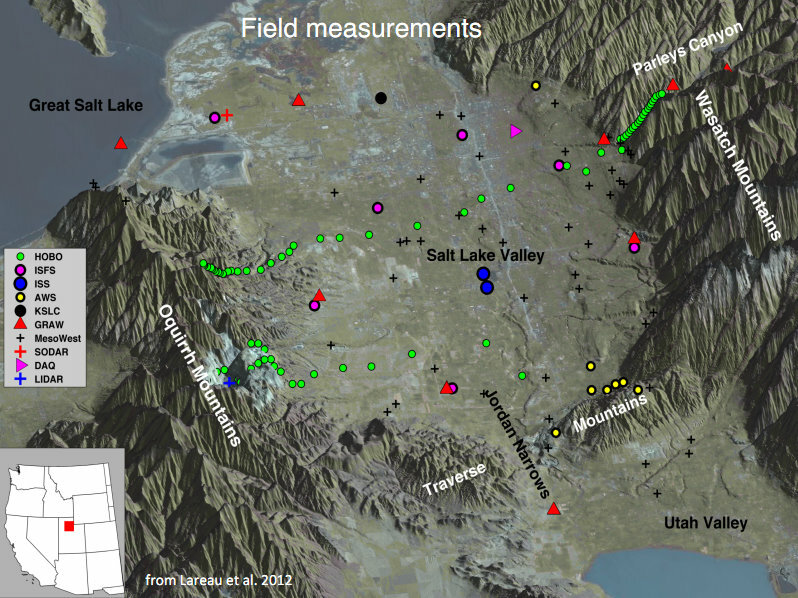 The University of Utah’s Department of Atmospheric Sciences recently chose the west side of Grandeur as a location to locate sensors every 100 vertical feet to take measurements throughout the winter of 2011. This study was called the “Persistent Cold-Air Pool Study” or PCAPS for short and they have generated some incredible data and interesting presentations, like this one (be patient, it’s 60MB). The solution to our pollution problem must come from reducing pollutant emissions. 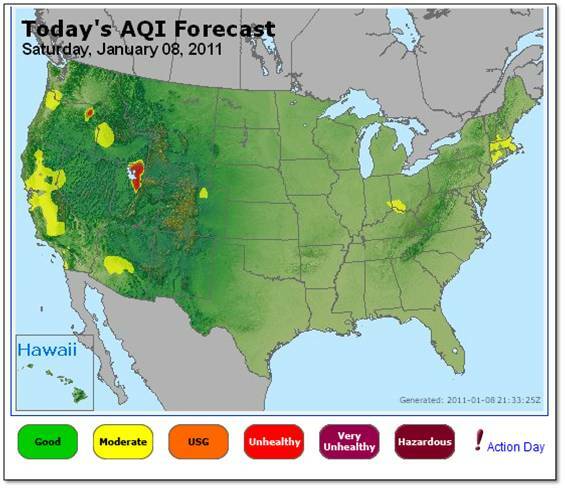 Breathe Utah is a local non-profit dedicated to addressing the root causes of air pollution. They are active in our local legislature and have been instrumental in many projects including the passing of Utah House Bill 146, “The Utah Clean School Bus Project”, which secured $2.3 million in funding for retrofitting all eligible diesel school buses in the state of Utah with particulate filters. The Grandeur Peak fund raiser was born out of my passion for the Wasatch Mountains and my unusual escapades up Grandeur Peak. I want this fund-raiser to bring awareness to the unique air-pollution challenges we face living in the Salt Lake Basin, raise money for an exceptional non-profit group, and encourage folks to come enjoy a summit or two (or three or four…) on Grandeur Peak. 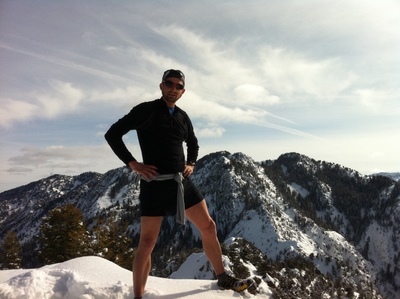 Join me on March 3rd, 2012 at the Grandeur Peak west side trail-head, I’ll be going at it from about 6AM until midnight trying to reach the summit ten times. Make whatever donation you can or make a pledge of $1, 5, 10 or more for each time I reach the summit as I shoot for my goal, which equates to over 33,000′ of gain, more than doing Mount Everest from sea level. Jared can’t wait to read the barkleys right up! So amazing, congrats ! Hey; great job! I stopped by with Brendan Nicholson and two other friends on our way home from ski touring in the afternoon, but we missed you. 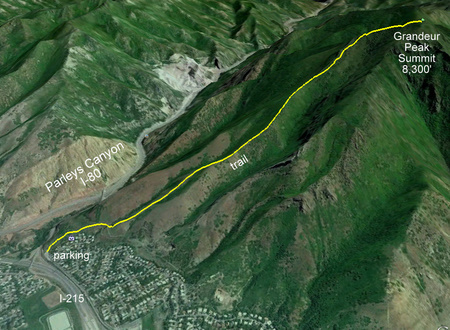 We did see two forms on the ridge about 20 minutes up from the trailhead, so that could have been you with a pacer. Congratulations on this extraordinary feat! Wow, you got the 10 done! Mostly good even splits too. That’s tough work for winter … anytime. Good job! PS: Couldn’t find Trib article. Way to go, nice work up there! Wow! Congratulations. I sent a straight up donation initially, but I will need to send another in honor of 10 laps. SImply amazing. Rest up. Congratulations Jared!! Seeing you complete your incredible Goal was truly Inspiring!!! Jared, Thank you for doing this. I left Salt Lake City four years ago and I’ve not had one asthma attack since I left. The funny thing is I moved to New York City, which you’d think the pollution would not be much better. Thank you for working toward bring more awareness to the pollution problem in the Salt Lake Valley. It looks like the Gods are not going to let you off so easy, Jared. I’m psyched to see it happen and go play in the snow. I’ve donated and I’ll see you tomorrow! You’re right! The Gods usually let me off easy, :), but not tomorrow. I’m also coming off a pretty wicked week-long sickness to make this more of a challenge…. Fortunately I have an army of friends who will be with me at 6AM to make a highway of a trail. It will be beautiful tomorrow! I guess i know where i’ll be on Saturday morning now. Great idea Jared. Jared, You are an inspiration to us all. I will come over this Saturday to show my support and to make a donation. Thank you for the awareness you provide to our valley. Thanks Heather! See ya Saturday if you can make it out. Nice!! The pledge should be for every time you do a lap down….Ouch!! Jared, you are an inspiration in so many ways. Breathe Utah thanks you so much for this, and we promise to continue to work tirelessly for cleaner air in Utah. Thank you Cameron. All I’m doing is slogging up a mountain over and over. You and Breathe Utah are doing all the really challenging work. I’m happy to turn a silly habit of mine into something constructive. GO JARED GO! Fantastic! I’ve donated and will hopefully join you on one of the last laps! You are amazing! Great! Looking forward to seeing you out there Sallie! This is totally awesome. I’ve donated and I’ll be there first thing Saturday for some laps and to help out however I can! Thank you very much Mike! I really appreciate your support and for spreading the word on your blog. See ya Saturday morning.